Racing in the Super GT - the cutting edge of Japanese motorsports - in the Hatsune Miku BMW and under the banner of the Hatsune Miku GT Project, Goodsmile Racing & TeamUKYO is asking you to take part in our personal sponsorship program and become part of a winning team. 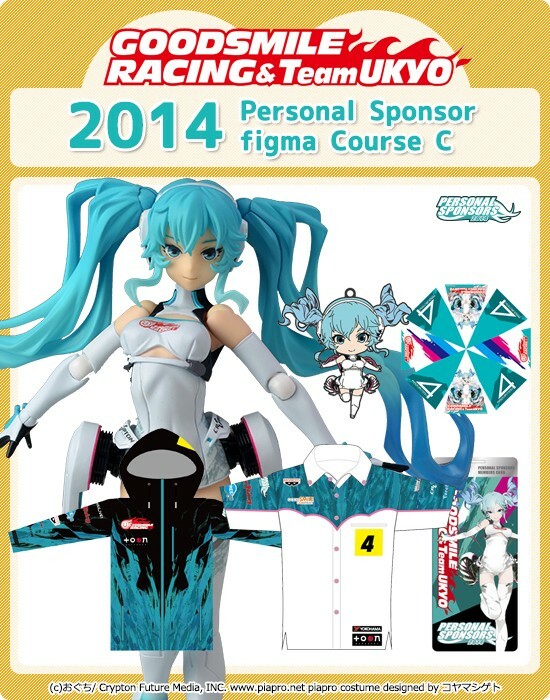 This time around, we're offering a 2014 figma Course, including a figma version of the GT Project's exclusive mascot character "Racing Miku 2014 Ver.!" A Personal Sponsorship Card will be included with this course. * As this course includes all the benefits of becoming a Personal Sponsor, this cost is reflected in the price. * Please note that Personal Sponsor Cards are issued 1 per person. If you place more than one Personal Sponsor Course order, only 1 card will be issued. Please note that if you have ordered any 2014 Personal Sponsor Course, future orders will not includes this benefit. We appreciate your understanding. Registration will be open from (Wed) Jul. 23 to (Thu) Sep. 18 at 23:59 (JST). ・figma Racing Miku 2014 Ver. *Please see size chart for measurements.